My neighbor walked over this afternoon and asked me why I wasn't sailing today. I should have been. It was in the high 60's, blue skies and a nice gentle breeze. But I had made a commitment to myself to start refinishing Spartina. There is a lot of wear and tear on the boat after four years of sailing. Nice warm weather, while excellent for sailing, is also great epoxy weather. It felt good to be doing some boat work out in the garage again. I spent 20 months building Spartina there. 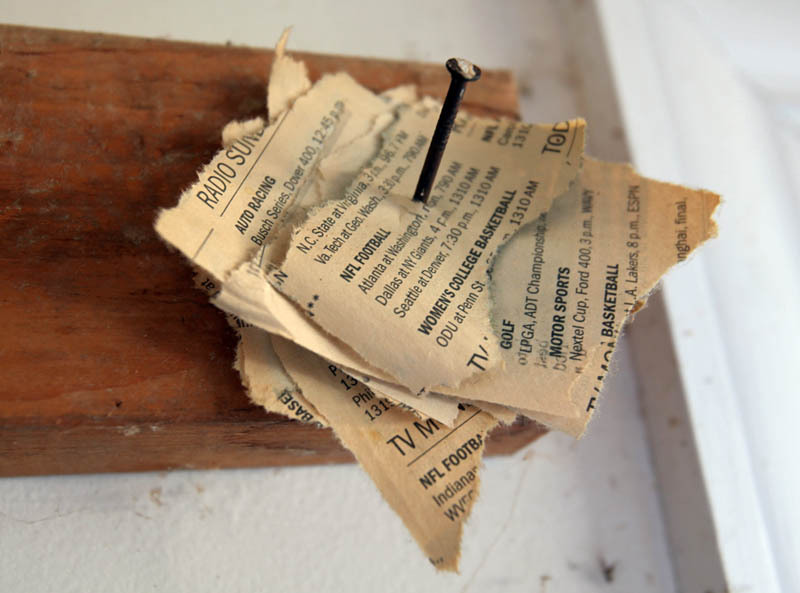 In fact the little newspaper clips, two seasons worth of local sunday football radio broadcasts, still hang on a nail out there. I worked on the boat seven days a week. On sundays mornings in the fall I would tear the nfl radio guide from the sports pages and hang it on that nail so I would know where to tune for what game as the afternoon went by. On a nearby cabinet are baseball schedules. I don't know that I could have built the boat without sports radio and 60's music. I have a lot of great memories of that time. Those bits of newspaper will probably hang there as long as I'm around. 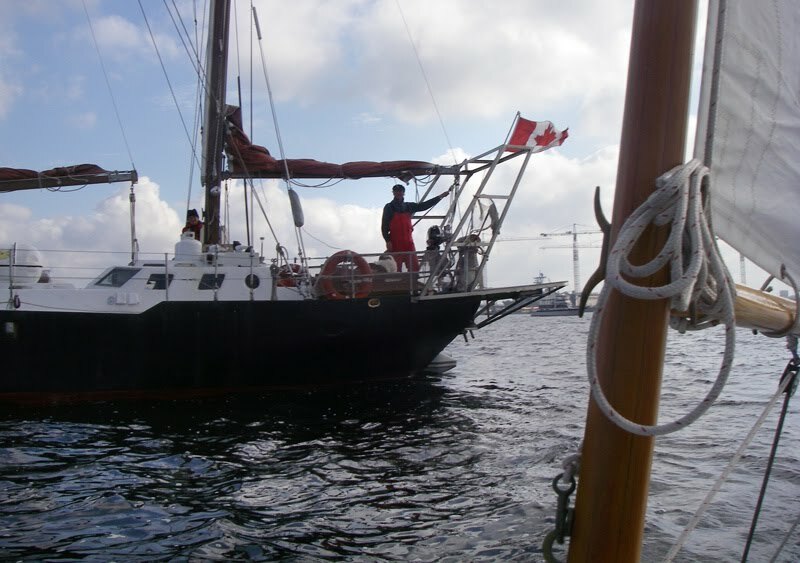 I pulled the main sheet and jib sheets off the sails, washed them in the washing machine with the docklines. I might have to replace the jib sheets by spring, they looked pretty worn. But the other lines are in good shape. And I sanded down the rub rails to refinish them with epoxy and varnish. The WEST system epoxy is now four years old. 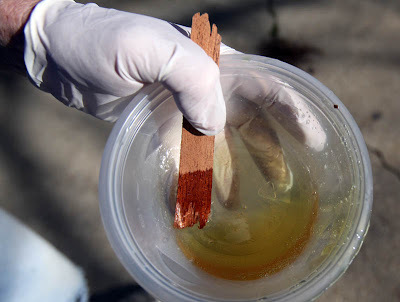 The hardener oxidizes after a while and gives the epoxy a nice reddish gold color. This does not affect the epoxy, but on bright work it adds a nice rich tone. That, plus six or seven coats of spar varnish, should make the rub rails look pretty nice by spring time. Check out that tee-shirt below, a nice thank you from the Eye of the World Expedition that left out of nearby Hampton a few weeks ago (I made a small donation). 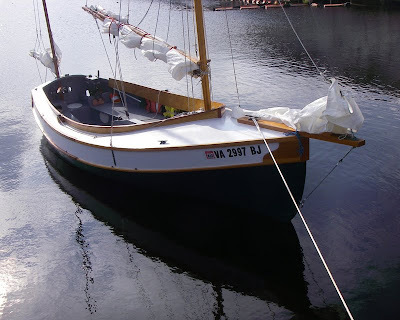 If you were fortunate enough to have had an adventure after getting out of college (I know I did), or if you even dreamed of having that adventure, you ought to check out these guys (and maybe consider a donation) - a round the world trip on a classic yawl that is now floating classroom. This is a good time to tune in to their blog - they are in Miami and celebrating the birthday of the boat's namesake. I should have been sailing, but at the same time I had a great day working on the boat. One of my goals for last year was to do at least one, or maybe a couple of weekend sails. I never got around to it. I think my mistake was waiting for that three day weekend to "happen". And when it did I would pack the boat and head out for a few days. But in reality work, house chores, errands or whatever got in the way. And it never happened. This coming year, "oh-ten" I've heard it called, I'll plan the weekend and make it happen. It could be a nice sail, maybe three or four days in late April or early May. A convenient spot for me, just a couple of hours away, is where the Pamlico River opens into Pamlico Sound. 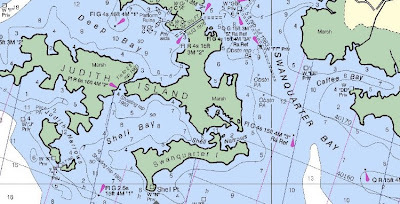 I've sailed through that area three times before - both the spring and fall of '08 on solo sails and then with Bruce this past spring during the SkeeterBeater. Each time I've thought it was an area well worth exploring. 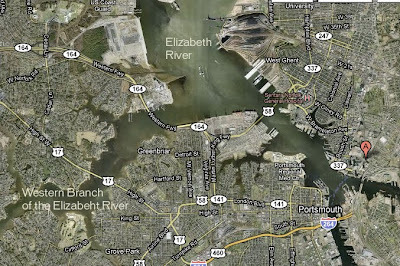 I did a little research on the web and found two nearby marinas. There is a Rose Bay Marina, but I've found limited information about that. I get the feeling it is more oriented towards shrimpers and crabbers. 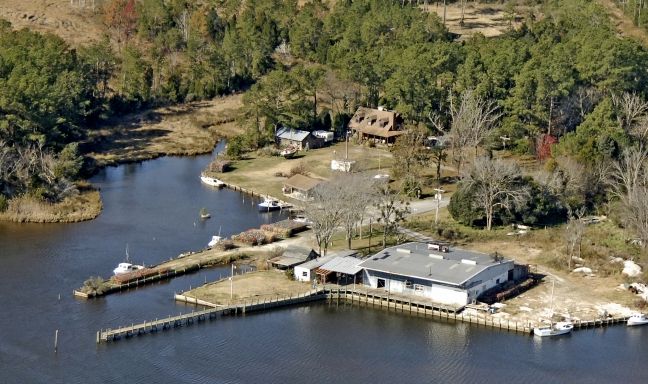 Vanhorn's Bayside Marina at the very top of Germantown Bay, looks like it might be the way to go. Below is a photo from their website (which I can't find right now). It looks like they have a ramp and enough room to leave my jeep and trailer for a few days. I'll drive down there this winter to say hello and see if it will be a good place to launch. As I mentioned I've sailed by this area before. Lots of bays, creeks and marshes. The photo below is from day two of the SkeeterBeater as Bruce and I had just passed Great Island and the wind kicked up (you can see the weather moving in at the left). We had dropped the main and were sailing under mizzen and jib as we entered Swan Quarter Bay. 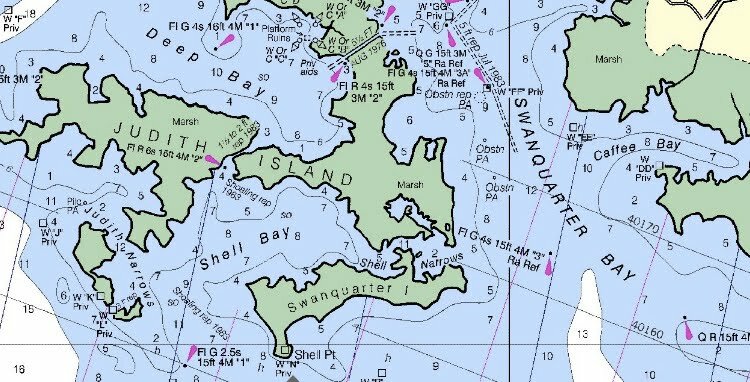 Below is our track from that afternoon, up Swan Quarter Bay and through a narrow cut into Deep Bay, Rose Bay and eventually Spencer Bay where we anchored for the night. You can read about that afternoon here. Below is the track going through the cut. It was a fast sail close to the wind. We always laugh about that part of the trip. It was windy and stormy and a fisherman at the northeast end of the cut didn't notice us until we were right next to him. We caught him by surprise and said hi, he didn't know what to think of us. All we could hear was him was him shouting "watch out for the thunderstorms" as we flew down the channel. 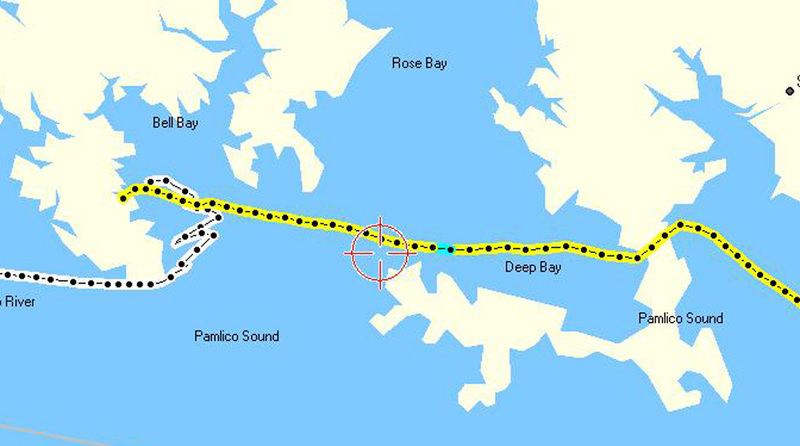 Below is a map showing the area from Swan Quarter Bay to Deep Bay. 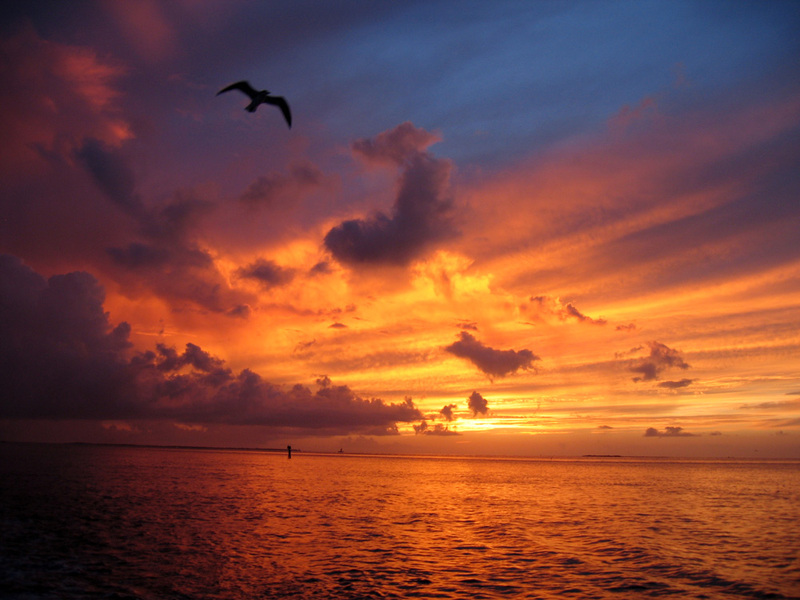 I would really like to spend an afternoon sailing around those islands. Nice protected water, great anchorages and maybe some good fishing. 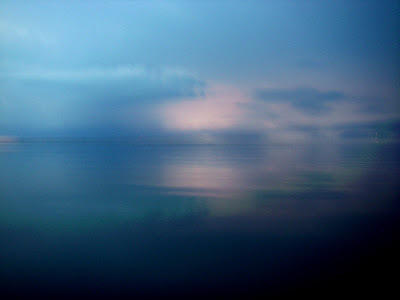 Below is a photo from an evening I spent anchored in Caffee Bay, just east of Swan Quarter Bay, as a small electrical storm passed by. It was after dusk and I was lucky to catch some lightning with a point and shoot camera. It was very nice anchorage and I would like to visit there again. And here is a photo of a shrimp boat as I crossed the mouth of the Pamlico River to Mouse Harbor in the fall of '08. The river is a just a few miles wide. 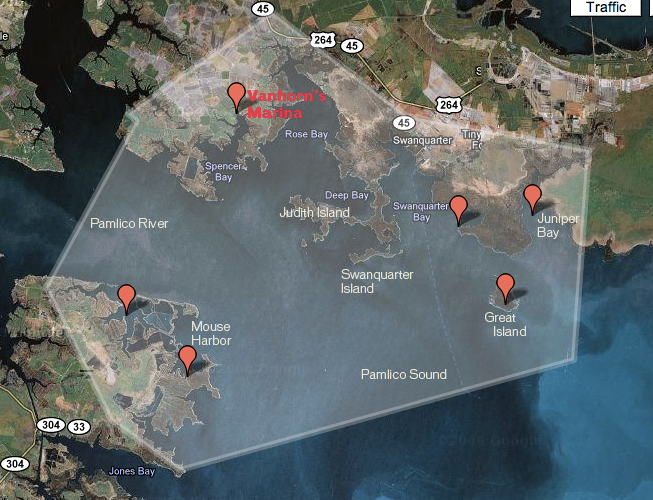 Mouse Harbor is a wide bay lined by countless anchorages. 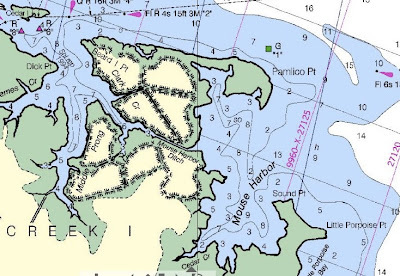 I spent the evening and night anchored in Cedar Creek all the way at the bottom of this map. This is what it looked like, nice rich marshland. I caught some puppy drum there, read a book and rode out an evening of thunderstorms as a front rolled through. All of the places that I've marked in the chart at the top, from Mouse Harbor in the southwest to Juniper Bay in the northeast, are within 17 miles of Vanhorn's Marina. I think it would be a nice three or four days of sailing down there. I'll mark it on the calendar and make it happen. Cold weather, fog and mist. Perfect for Thanksgiving. "...there were the boat sounds, the water sounds.....a bird's wing against the wind...the distant sounds of the forest...these things that no man can buy; these things that build the memories of tomorrow, the hours to look back upon..."
A while ago I heard a guy say "sometimes you got to put a dime on the needle to keep it in the groove." I liked that phrase. I knew exactly what he meant - put a little more focus, a little more effort into the task at hand. I wondered if anybody from the ipod generation would know, in a literal sense, what he was talking about. Today was my last sail of the year. This is, I believe, the latest I have ever sailed around here. It has been a great year on the water. Two great cruises and a lot of daysailing. 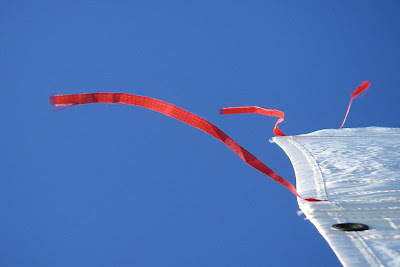 The forecast was for rain today, but I woke to clear blue skies and a nice breeze. So I hooked up the trailer and headed to the ramp. You can see the weather started out very nice with blue skies. 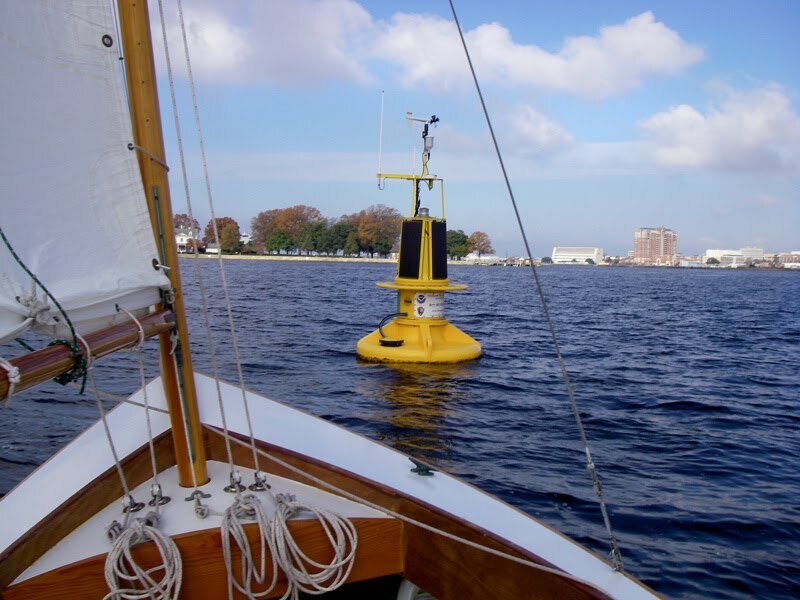 There is my local weather station, part of the Chesapeake Bay Interpretive Buoy System. With a computer or phone I can get up to the minute data on the weather conditions. Right now it tells me that the water temperature on the Elizabeth River is below 60 degrees. That is the reason my sailing season is over - I don't have the gear ( a drysuit) that I would need to sail safely in cooler waters. The folks above aren't worried about cooler temperatures. They are southbound from Montreal, headed for Nassau, Bahamas. Sounds like a nice winter to me. 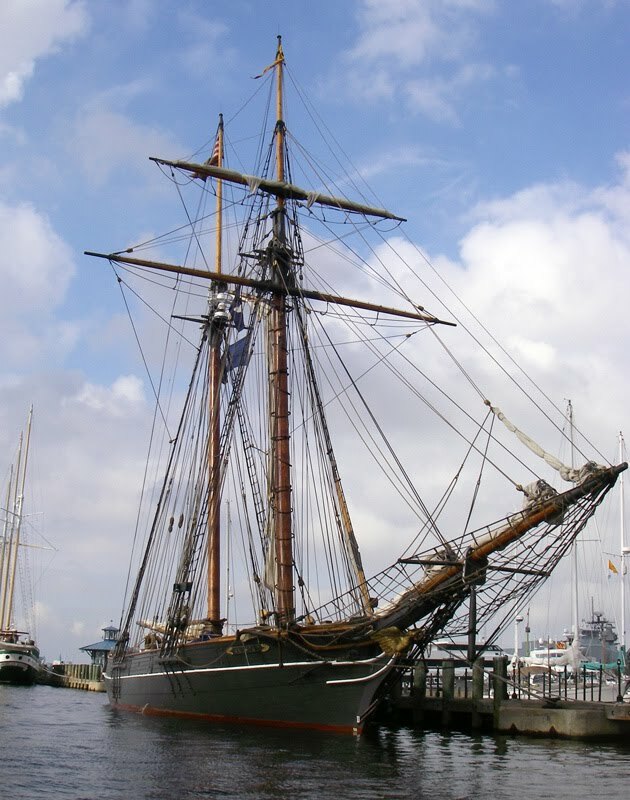 And another interesting ship was in port today, the Amistad. 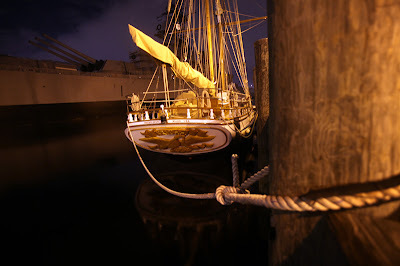 This is a replica schooner of the slave ship that was taken over by slaves and sailed to a US port. I was lucky enough to sail on the Amistad a few years ago, I took that photo below hanging in a harness below the enormous bow sprit. The real treat of the sail on her was getting to meet Captain Bill Pinkney, an interesting man that first made his name in the sailing world by doing a circumnavigation in a boat that became a floating classroom for school children. 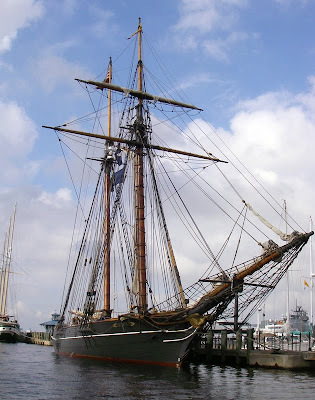 I've got some great memories of the sail down Chesapeake Bay on the Amistad, it was good to see that ship again. 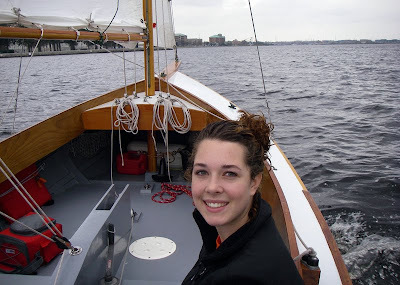 But I've got to say the best part of today's sail was having my oldest daughter, home from college for the holiday, join me on board Spartina. She used to be a regular part of the crew, she was always good at handling the mainsail and jib halyards. It was nice to have her around again. 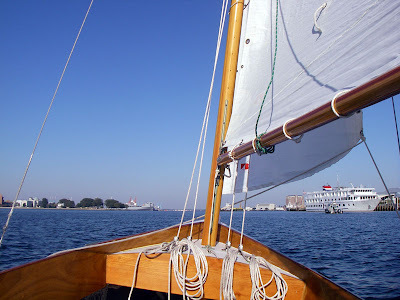 She took this photo of Spartina after I dropped her off on the waterfront, a nice little memory of this last sail. With sailing done for the year I've got a lot of my plate. There are a lot of chores I need to do around the house. Plus Spartina, after four years of sailing, six cruises and countless day sails, needs some paint - hull interior, exterior and bright work. 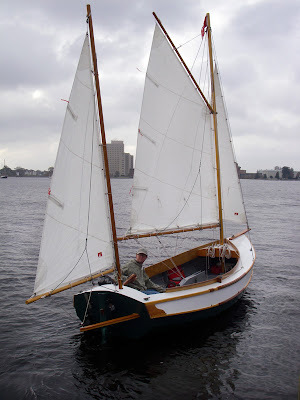 And I've been trying to write a magazine article about The Crabhouse 150 sail. How do you take a seven day trip and boil it down in to 2,000 words? So I've got a lot to do this winter. I guess I need to put the dime on the needle. I was down on the Norfolk waterfront this evening and photographed a couple of interesting boats. 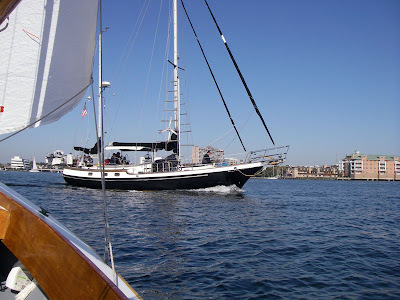 That is "Fritha" below, a very nice looking boat out of Massachusetts. Beautiful boat, a square-rigged schooner maybe(??). 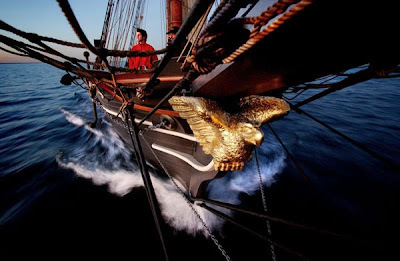 Look at that beautiful carving on the stern. And look to the left and you'll see some of the guns of another impressive ship. 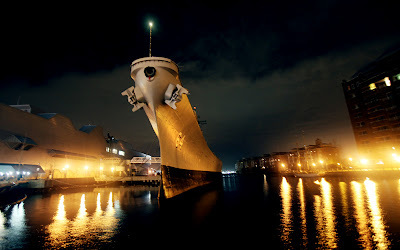 That is the battleship USS Wisconsin. There is her bow below. She is now a floating museum, a spectacular part of downtown Norfolk. It was a nice walk along the waterfront. It reminded me of the 1970's in San Diego. Bruce was just out of the army, I was just out of high school. 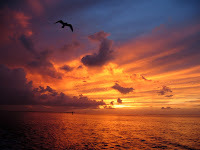 We both enjoyed photography and I remember some nice evenings on the shore of San Diego Bay photographing the fishing boats. Remember that, Bruce? Here's a quick map update, something to give Bruce and myself room for discussion. Yellow means anchored out, red means hotels available. Overall distance is just over 150 miles. I (along with my wallet) prefer anchoring out, Bruce prefers hotels (I do admit I have never once griped about a nice hotel, hot shower and good restaurant) - so we do a combination. Oriental and Beaufort are great waterfront towns, so I want to build in time to relax and have a beer. There is plenty of room for adjustments here, I can see some changes already. It is getting cool outside these days, so it is fun to stay inside and look at maps. Below is a Timex Expedition watch that I've had on Spartina since she was launched. It had belonged to my Dad, I brought it back and hung it in the cockpit on the transom under the aft deck. 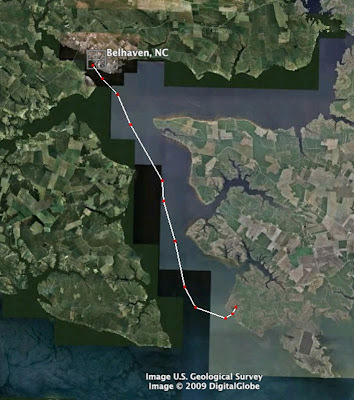 It had swung back and forth with wind and waves for so many miles, from Pamlico Sound to Punch Island Creek, that it had worn an inverted arch in the grey paint. I went to change the time the other day and the stem pulled right out of the watch. 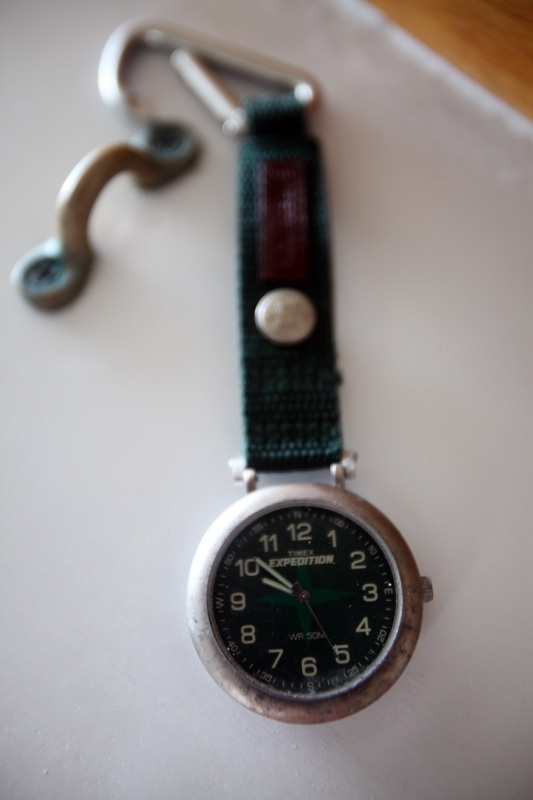 I guess rain water and salt spray are not the best things for Timex watches (where are you now John Cameron Swayze?) (Then again, I could have rinsed it off once and a while.) So I need to get a new watch for next year. Which has me thinking about other changes I need to make for next year's cruises. I do need to get a new flashlight. I'm looking at the one below, a Pelican 2410 Recoil LED. It is on sale now for under $50. 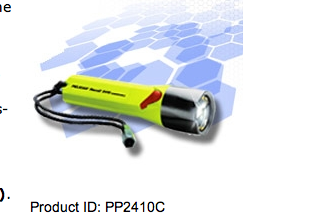 That is pricey for a flashlight, but it has a lifetime guarantee. I'll have to think about it for a while. It does use AA batteries. I try to have all the gear on Spartina use AA's, makes it simpler for supplies. In fact I just bought a 36 pack of AA for $13 at Home Depot. That should last me all of next year on the boat. I also need to get a new knife. The old one corroded and fell apart. The other change I am thinking about for cruising is pulling the 60 lbs of ballast (in the form of four 15 lb dumbbells) out of the boat. 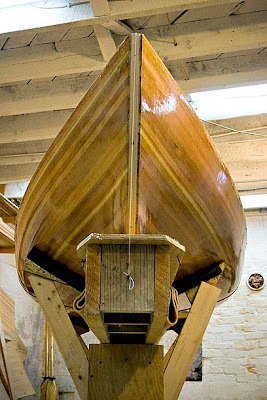 John Welsford's original plans called for a weighted centerboard and then experimenting with sandbags to get the ballast right. I put in a steel plate cb weighing 100 lbs plus the dumbbells at 60 lbs. That, to me, is just right for day sailing. But when on cruises there is quite a bit of gear, food and water on board, certainly more than 60 lbs. A look at Kevin B. 's video tells me Spartina does not need all that weight. She performed great under some pretty stressful circumstances - no complaints there - but she does look a bit low in the water than she needs to be. So maybe I'll pull out that extra weight. Other than that, we are in pretty good shape. Safety gear, cooking gear, sleeping gear are all tried and true. 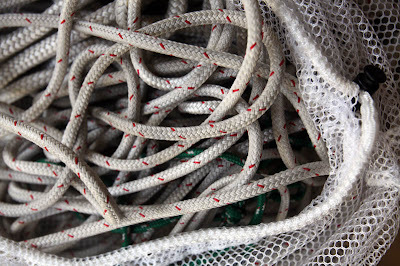 The changes mentioned above are just a fun part of getting ready for a sail. 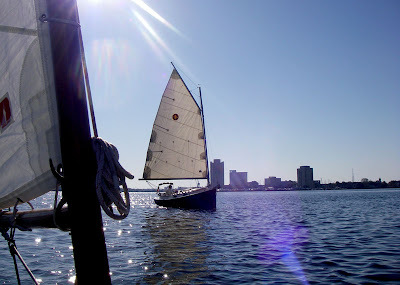 I got out on the Elizabeth River for (possibly) the last sail of the year today. It started out cloudy and foggy but quickly cleared to clear blue skies. Wind was moderate to light, but no complaints here. Just fun to be out on the water in 70 degree weather in mid-November. I know everybody must be tired of seeing this shot looking out from Spartina over the Elizabeth River, but I never get tired of seeing (and shooting) it. So no apologies here. While I was out I was thinking it was a day for small boats on the river. There were some snow bird boats heading south, but otherwise very few local big boats out on the water. Maybe they were winterized already. Most of the local sailboats on the water were small boats. 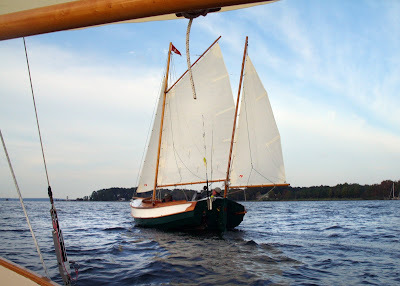 The catboat I mentioned last week was out there, he was motoring downriver towards the James River where he does most of his sailing. And I also saw a Melonseed Skiff that I have come across before. As usual I don't know the owners name but we wave and say hello. 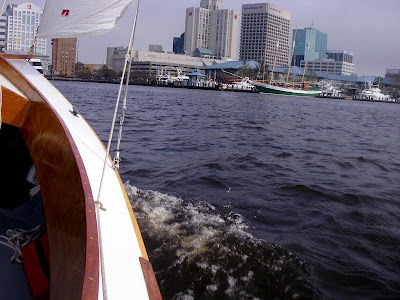 It is a great little boat that he sails out of the western branch of the Elizabeth River. I think the boat is called Ruddy Duck. It is fun to be out there sailing with a classic looking boat like that. There is a drawing of a Melonseed Skiff below. 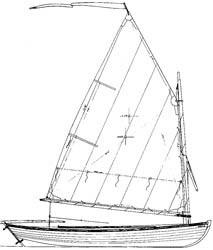 The classic plans for the boat were drawn by Howard Chapelle. It's a gunning skiff designed for hunting waterfowl. 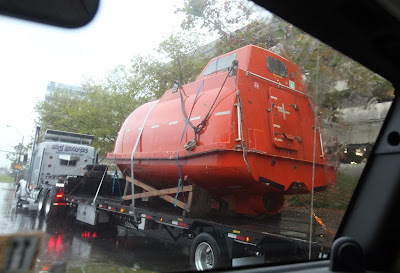 I believe Rubber Ducky was built by Roger Crawford, it is a beautiful looking boat. 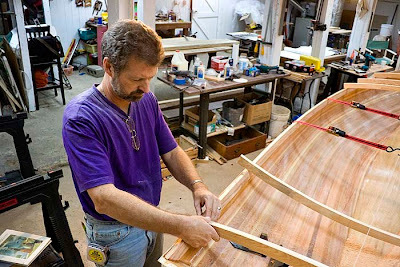 He builds a fiberglass hull and then will fit it out with whatever wood trim the owner might want. So I get home from a nice day on the water and get an email from Barry (below). 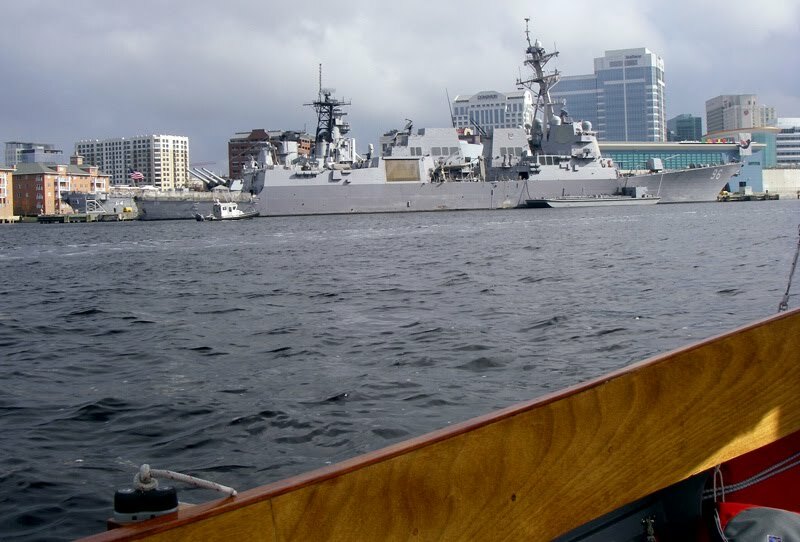 He sent a nice note about this blog (thanks Barry) and mentioned that we had met briefly at the Mid-Atlantic Small Craft Festival courtesy of our mutual friend Kevin. Barry says it was an awkward, brief meeting (which I can believe - I'm a social misfit and most meetings for me are awkward). I checked out Barry's blog and he is building - of all things - a Melonseed skiff. In fact I think he is building two of them. Neat! This looks like beautiful work and I can certainly see how these boats will fit right in with all the art work floating on the water at the Small Craft Festival. We had just a brief meeting in St. Michaels but I do wish we had more time to visit. It was a nice coincidence to see a Melonseed on the water this afternoon and then hear from a Melonseed builder this evening. Barry says he has plans to sail in some of my sailing areas. I'll look forward to seeing his boats on the water someday. SandyBottom started today on an interesting trip. 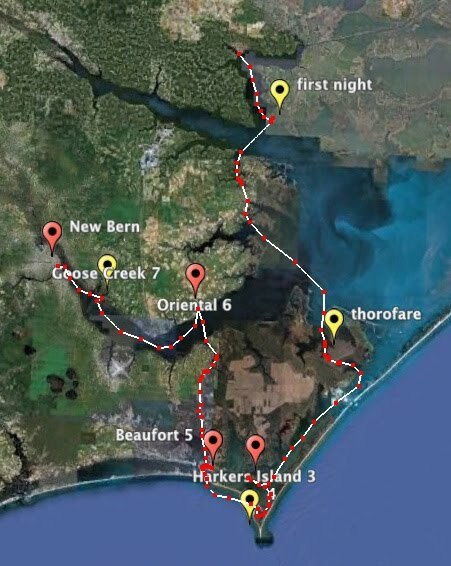 She and a group of experienced kayakers are paddling the Georgia coast. It looks like they will be going "outside", paddling beyond the barrier islands on the ocean. 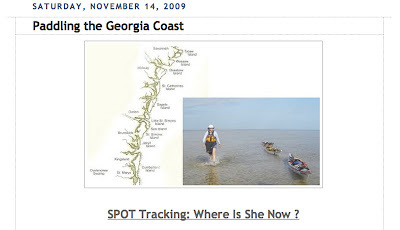 She has posted her SpotTracking page, you can see it here. You can also see her blog here. I'm not a kayaker, but I'll enjoy following her trip as I wrap up my sailing season with a daysail tomorrow (and maybe one next weekend???? please, please, please). Down in one of my favorite places for a few days, the Outer Banks of North Carolina. I used to come down here a lot to fish and relax but now I'm down here to see the storm that has been hanging off the coast for a couple of days. Above in the Bonner Bridge which connects the upper banks - Kitty Hawk, Kill Devil Hills and Nags Head - with Hatteras Island. 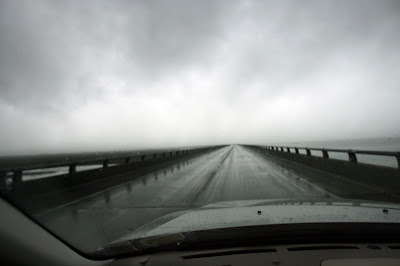 There were low, ominous clouds hanging over Oregon Inlet when we drove across yesterday. This storm has given us constantly changing skies. One minute it will be dark and cloudy, then sunny, then pouring rain. A lot of wind and big waves are constant. 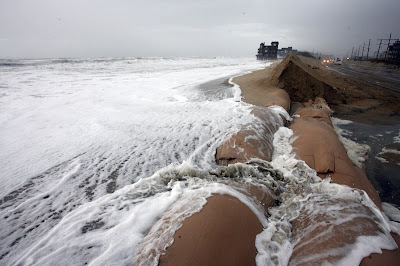 The dunes had been breached just north of Mirlo Beach at the north end of Rodanthe (on Hatteras Island). 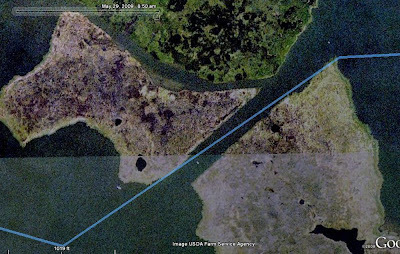 I heard that the original breach had occurred during a weather event a couple of weeks ago. 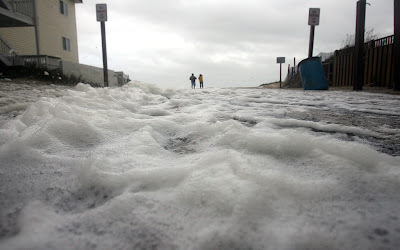 Waves were taking advantage of the breach, pouring over the sand bags (and this was at low tide). Last I heard the road was closed indefinitely because of all the sand and water. Water, still a couple of hours before the late afternoon high tide, was streaming down the beach access area. 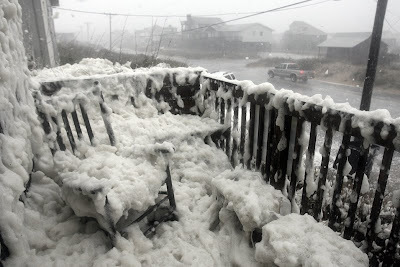 And for some reason the sea foam was blowing around the corner of this oceanfront house coating the deck. It almost looked like snow. I'll probably be around here for another day, but hope to get home for some nice sailing weather Sunday. ps - Looking over this post I just noticed there is almost no color in the photographs. But that's the way it is down here right now. All the color seems to have taken away by the storm. me: Can you tell Mom I need to be down here one more day? daughter: (after long pause) You're not here? I mean seriously, you're gone? me: Yes, I've been gone for a couple of days. 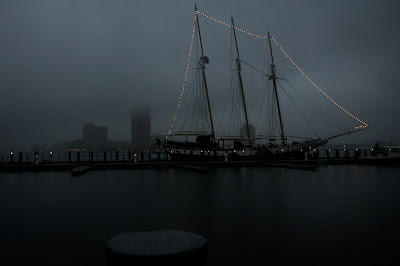 "we're naught but humble pirates"
I've seen a lot of boats with interesting histories pass through Norfolk on the Elizabeth River. This one caught my eye this morning and I wasn't even on my boat, just driving to work along Waterside Drive. It didn't look all that remarkable from my jeep this morning but back in April it caught the attention of the country when three Navy SEALS looked at it through the scopes on their sniper rifles. 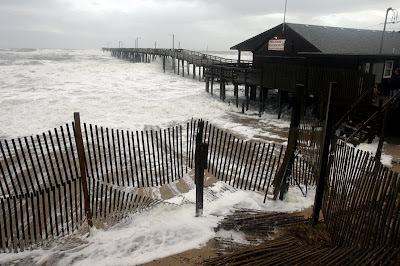 In the meantime I'm heading down to the Outer Banks to check out a storm for the next few days. Down there the big storms are often remembered by the day on which the occurred. There was the Halloween Storm (1991) (at the same time as the "Perfect Storm" event farther north) and the Ash Wednesday Storm (1962). Looking at the calendar I've got to wonder if this will be the Friday the 13th Storm. 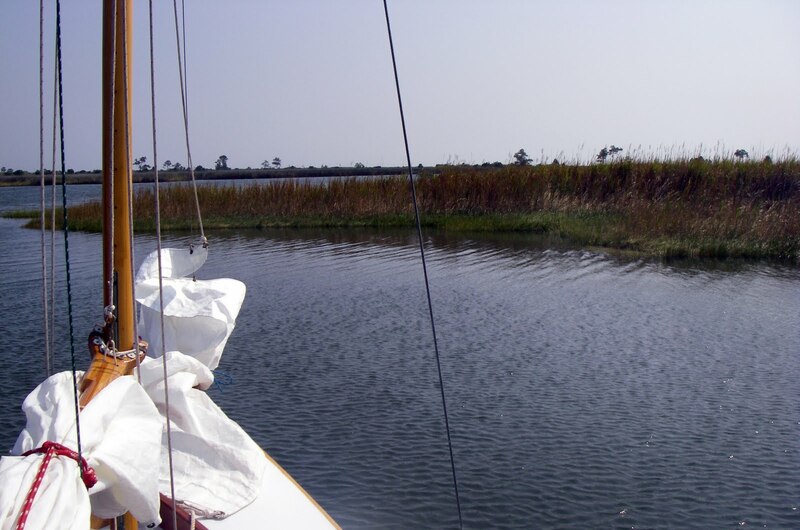 Just digging back through some old photos from our '07 Pamlico Sound trip and thinking about next year. 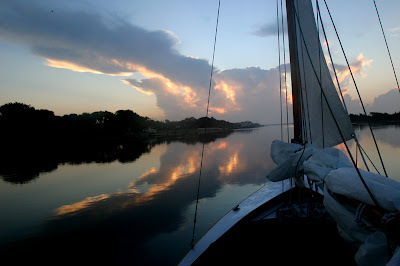 Below is a predawn photo heading down Taylor Creek east of Beaufort, the last day of the trip. I remember lugging our gear down to the town docks before there was even a hint of the sun on the horizon, looking down at the at tide pushing the water to the east. It was a spectacular morning and a great way to end the 100 mile journey. I'm just glad the tide was going with us. And I think I've shown some frames similar to the one below in the past, but I can't help but like the photo so I wanted to show it again. 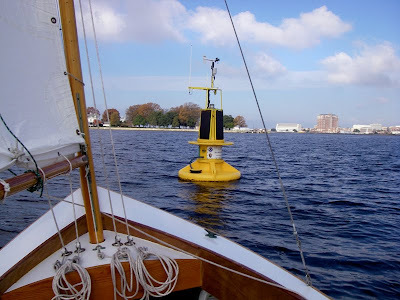 That is at the very bottom of Pamlico Sound just east of the Swan Islands. The wind had died and it was glassy calm. What do you do? Throw out the anchor, a climb-back-aboard line and go swimming. It is the unexpected events, the unplanned moments that are the most interesting. Thinking about next year I had been looking at starting in Washington, NC and heading east down the Pamlico River to Goose Creek and the ICW. But the Pungo River has caught my eye and maybe for the first day we should put in at Belhaven and head down the Pungo River to one of the little creeks near the junction of the Pungo and Pamlico Rivers. The river is about two miles wide and part of the ICW. It is about a 12 mile sail straight line to the mouth, but certainly more if the wind is out of the south or southwest and we need to tack. But an easy sail either way. 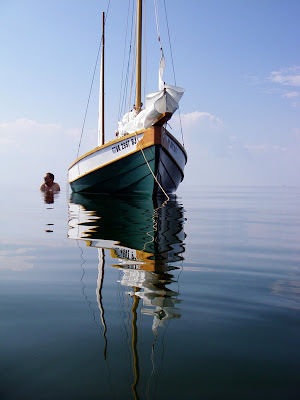 With the drive down in the morning, rigging the boat, packing, etc, it is nice to start a trip with a short sail, get in to an anchorage and relax. This is the route I am thinking about. Hmmm, has possibilities. I talked to Bruce today and he mentioned, correctly, that I should have explained in more detail why my JW pennant reminds me of my folks. It is because the J and the W represent not just the designer John Welsford, but also my folks -- Jan and Walt. That worked out perfectly. I would not have even started building Spartina without my Dad's help. 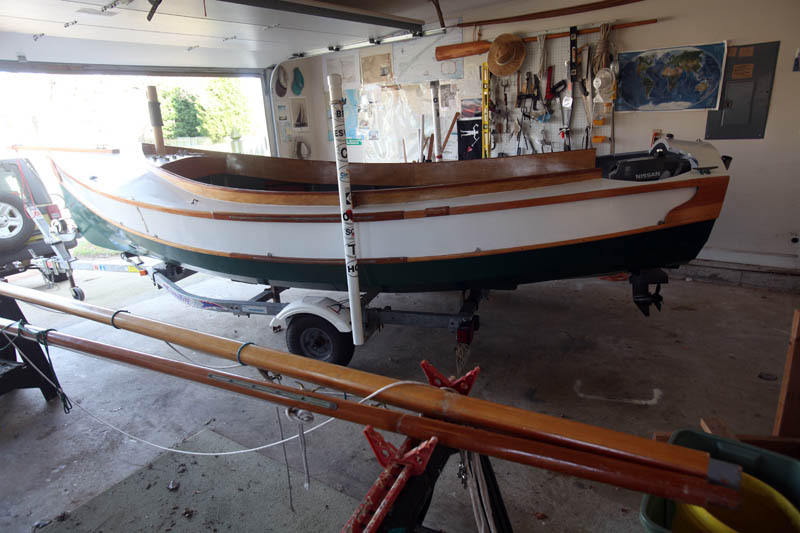 The first phone call I made when I was considering building the boat was to my Dad - "Can you come back to help me build the bird's mouth mast?". Of course he did. We spent four great days working together on it with help (wouldn't you know it) from my Mom. And then my Mom sews the sail covers for me. So that is why the JW pennant reminds me of my folks. My only regret is that my Dad couldn't stick around to sail Spartina, but as I see it he is with me on every sail. 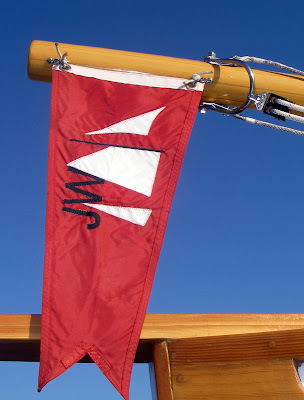 (If any JW builder is interested in the pennant just email me and I'll send you the jpeg that The Sailbag Lady used to sew mine). It was a beautiful day on the water. 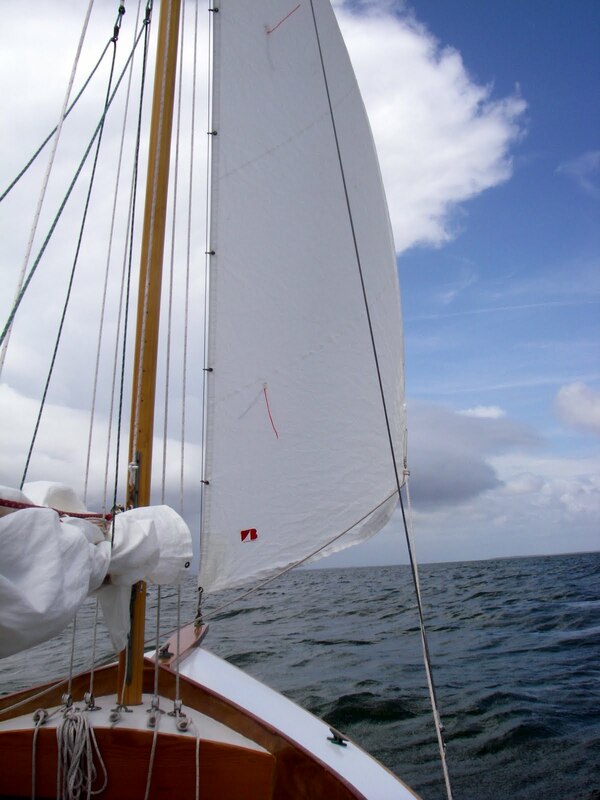 Not a cloud in the sky, wind out of the wnw at 6 or 8 knots. 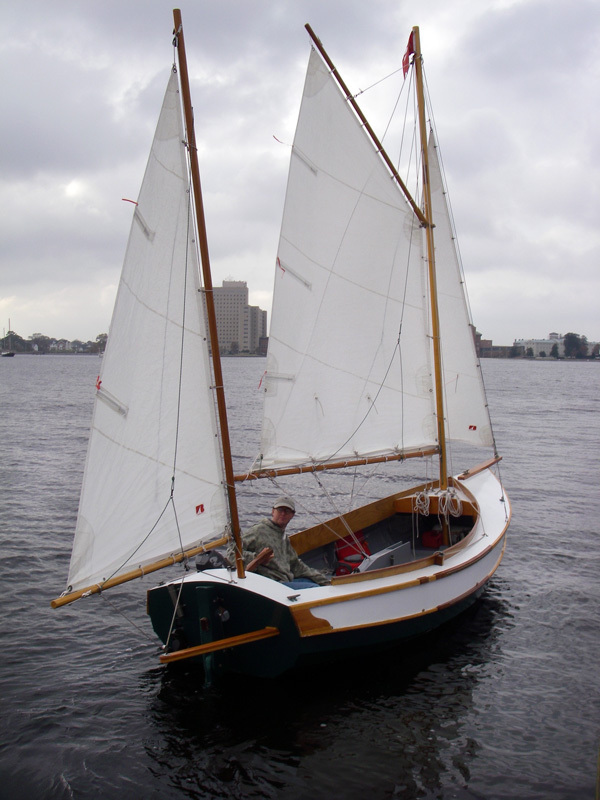 Below is my sailing friend on his 19' catboat. I can't tell you his name or the boat's name. But I can tell you he used to live in South Dakota and sailed the catboat on the lakes and reservoirs there and in Missouri. Now he lives here and keeps the boat in Portsmouth. 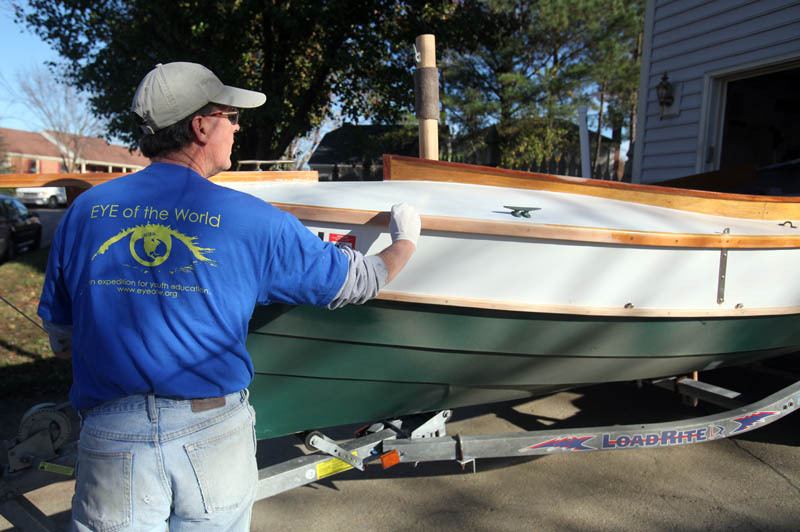 He said he is looking at a larger catboat. I can't wait to see that on the water. We pass each other on the Elizabeth River while day sailing. It is always good to see another gaff-rigged boat out there. And there were a few more snow birds heading south. The big batch of them went through last weekend - I think I counted over 20 on Crawford Bay last Saturday. But now they are coming through in two's or three's. The wind disappeared around noon, perfect time to tie up and get some lunch. Then it returned, this time out of the north. Great to sail, listen to some football on the radio and wave to folks on shore. I had a great time. I hope to sail one of two more times this season. But depending on weather and schedules this well might have been my last sail for the year. If that is so, it's ok by me. It was a lot of fun.